Promoting globalization and a new 21st-century worldview, the U.S. higher education system is welcoming a fast-growing number of international students to their campus and also encouraging more American students to study abroad. Many institutions assert that, by having more international students on campus, they can bring awareness of global competitiveness and prepare both their domestic and international students to become the world’s future leaders. A fast-growing number of Chinese international students are studying at the U.S. higher education environment; however, the cross-cultural interaction among the domestic students and the Chinese international students is an area with difficulties and missed opportunities. A qualitative research completed by C. Liu in April 2016 as part of her doctoral dissertation for the University of Pennsylvania, Graduate School of Education, performed an investigation on the cross-cultural social interactions among two groups of students: the Chinese international students and the U.S. domestic students. 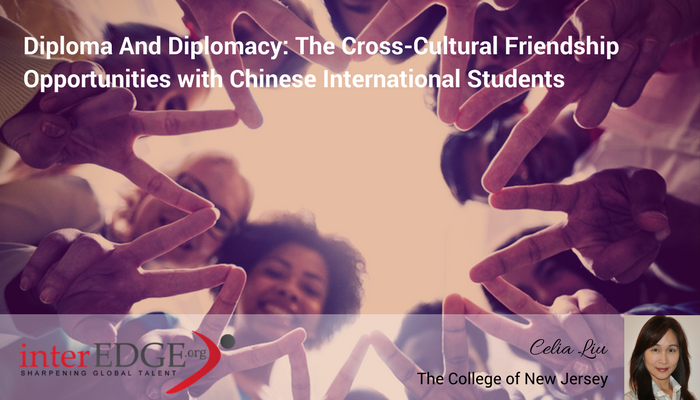 Entitled “Global Friendship in the U.S. Higher Education Environment”, this study illustrated how cross-cultural friendship among the domestic students and the international students can be mutually beneficial and can enhance the educational experience campus-wide. The concept of global friendship can help the world reduce conflicts and achieve cross-cultural interconnectedness. This research involved two phases of in-depth personal interviews. The first phase interviews were conducted among equal numbers of U.S. domestic students and Chinese international students. Personal experience of both groups of students in three different settings—classrooms, residence halls, and clubs—were explored and collected. The second phase interviews involved faculty, instructors, administrators at residence halls, student life/activities departments, and psychologists at offices of Counseling and Psychological Services. This research applied an inductive analysis approach to establishing clear links between the evaluation and the findings. The investigation leads to develop a theory about the underlying structure of the experiences determining what helps friendship to start (initiators) and what hinders friendship (barriers) between the international students and the domestic students. This research uncovered the social distance and stereotypes between the two groups as the common barriers to friendship. Conversely, the initiators of friendship are the shared experience and equal status between the Chinese international students and domestic students. This study indicated that the initial barrier for making friends among the international students (who had their k-12 education in another country outside of U.S.) and the U.S. domestic students includes: the differences in culture and social practices, the lack of shared common interests or hobbies as ice-breaker to initiate the friendship, as well as the lack of shared future plans or common career outlooks as connectors for maintaining the friendship further. The investigation leads to revealing that the foreigners’ social distance described in American sociologist Bogardus’ social-distance scale and the pre-existing stereotypes are both predominant barriers among the international students and the domestic students. It is important to note that this research discovered that the stereotypes exist in both directions. Not only the domestic students have pre-existing generalizations (stereotypes) toward the Chinese international students, the international students hold stereotypes toward the domestic students as well, which sometimes prevent them from reaching out for friendship with the domestic students. Conversely, this research also discovered many positive signs about the development of cross-cultural social interaction lead to opportunities for “global friendship.” With the number of international students (1,043,839) representing 5.2% of the total student numbers in U.S. higher education (20,264,000) environment in 2015-16, every 20 students you meet on U.S. campuses, one could be an international student from abroad. This increases the opportunities for our higher education to offer cross-cultural training and to promote multicultural awareness within the demographic of our student body. Increased contact and shared experiences are evidenced as successful cross-cultural friendship initiators. For example, sharing residence halls as roommates and participating with student-life activities create ample opportunities for our students to interact with those from countries outside of America. The U.S. students who had study abroad experiences especially demonstrate empathy and compassion, toward the international students who are studying in the U.S. colleges and universities. Faculty and administrators expressed their optimism about the development of global friendship among our young generation. Though we see some barriers initially for the cross-cultural interactions, the internationalization in the higher education environment ultimately is our best opportunity to promote diplomacy while these students, the future world leaders, are learning together in our U.S. higher education campuses. Institutions should prepare the ways for global interconnectedness by promoting inclusive, world-ready classrooms; implementing a campus climate that explicitly welcomes international participants; and advocating the concept of cross-national global friendship as a part of 21st-century education. In Social Distance in the City, Bogardus (1926, p. 40) states: “Social distance, or the lack of fellow-feeling and understanding, continues to exist after spatial distances have been eliminated.” Bogardus defined the concept of social distance as the degree of sympathetic understanding between two individuals, between an individual and a group, and between two social groups. The social distance theory, developed by Bogardus (1938), is as follows: (1) family members, (2) friends (chums), (3) neighbors, (4) coworkers, (5) citizens of my country, (6) visitors to one’s country (sojourners), and (7) those excluded entirely from one’s country. These findings lead to a necessary discussion of two topics in sociology, Social Distance and Stereotype (and Prejudice), which were not the conceptual framework guiding this research; instead, they are the findings discovered from the interviews. This blog article was contributed by Celia Liu. She is an instructor at the World Languages and Cultures Department at The College of New Jersey. She holds a Doctor of Education in Higher Education Management from the University of Pennsylvania, a Master of Arts in Teaching of Chinese Language and Culture from Rutgers Graduate School of Education, and an MBA in accounting and Taxation from Fordham Gabelli School of Business.